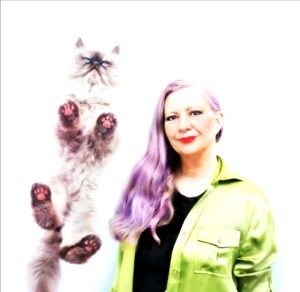 Our guest post today by Letrisa Miller, MS, DVM is about one peeing out of the box. It’s the most common behavioral issues I encounter as a cat behaviorist and it’s not surprising for the reasons outlined. I’d like to add how important having a litter than attracts a cat is, and to gradually change if switching brands. Ever wake up in the middle of the night and wonder what that cold wet puddle on the floor is (which you of course noticed after stepping in it)? Or wonder where the wet spot on the couch came from? I expect that most of us cat folks dread that it is urine from one of our feline friends. Unfortunately, for many reasons the summer is often the time of year that cats begin to have issues with the litter box. Why is that? There are many reasons. The children are home and playing loudly around the cat all day. A new puppy joins the family and the cat has decided that the floor is not a safe place to be. Schedules have changed. Everyone is busy and the box doesn’t get scooped or changed as often. Fans and air conditioners are running loudly. There are guests in the house. The cat’s usual routine is out the window. Many, many possible cat stressors are more common in the summer. Stress is the most common cause of feline idiopathic (interstitial) cystitis, which is the most common cause of urination outside of the litter box. Avoidance of stress in the household and making sure that cats get plenty of water is the best way to prevent idiopathic cystitis. Water intake is best ensured by feeding a high-quality, high-protein, canned diet. Water fountains are also helpful. 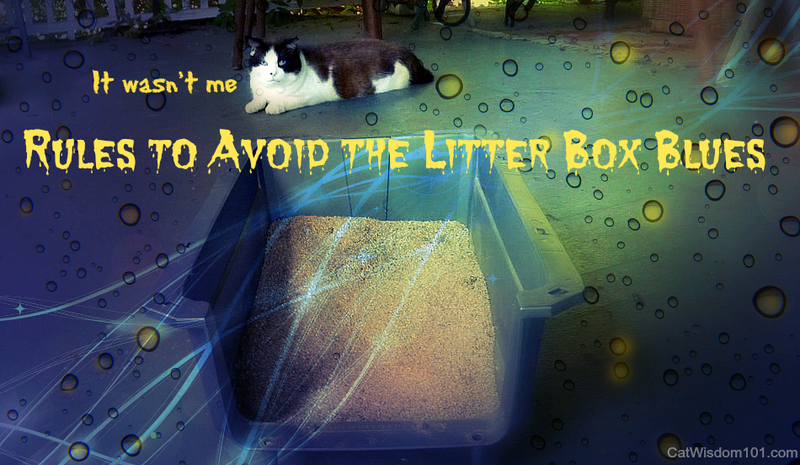 Fortunately, by following a few simple rules, you can often avoid many of the other causes of litter box woes. My most important rules are listed below, but please keep in mind that any cat that starts urinating or defecating outside the box needs a thorough health check-up. The majority of cases in which cats suddenly start to urinate or defecate inappropriately have at least some basis in a medical problem that will need to be solved before any behavioral component can be successfully addressed. 2. The litter box must be in a quiet, secure area. Avoid placing the box in noisy areas (laundry rooms, furnace rooms, etc. )dark areas,core area (where the cat eats, drinks, and plays most often, dead ends areas that can be accessed only by stairs,high-traffic areas (particularly where loud people, big or small, are common). 3. The box must be accessible. Kittens and older cats should not have to travel far or up or down stairs. Also, the litter box needs to be positioned so that cats can enter and exit from at least two directions. Example: A box that is between a toilet and cabinet or bathtub has only one way in and out, whereas a box in a corner has two sides for entry and exit. 4. The box and area must be kept clean. 5. Some cats won’t use the same box for both urination and defecation. This means that you might need to provide more than one litter box. Note, however, that many cats consider two boxes beside each other to be one box. 6. In multi-cat households (or any household where the cat might be startled by another cat, a dog, small children, etc. ), don’t use covered litter boxes. 8. Don’t place litter boxes in areas that can be guarded by another cat or dog. One of the most common causes of inappropriate toileting in multiple-cat households is litter box guarding by one cat. Dogs also tend to startle cats in litter boxes when they come sniffing for cat tootsie-roll treats. 9. Litter must be deep enough that urine does not pool and cause litter to clump on feet. 10. Litter catchers/litter tracking reducers may cause problems with cats that find them uncomfortable to walk on. 11. Scooped excrement should not be kept next to the litter box. 12. The litter box must be large enough to accommodate the cat. 13. Older, sick, and arthritic cats should be provided with litter boxes with low edges (2″ high) and no more than 2″ of litter for defecation. 14. If your cat has difficulty squatting and sometimes misses the litter box, “pee-pads” can be placed on the floor around the litter box, or a deep box with an entrance cut out can be used to provide high sides. The keys are that the cat must be comfortable approaching the box; must feel safe, solitary, comfortable, and quiet while using the box; and must have a safe, secure exit. Cats are vulnerable while using the litter box, and if they are nervous or frightened they will find a more comfortable place to go. Thanks for providing wisdom for us humans…. in truth, the cats are the wise ones! I identify with “The Litter Box Blues”! My cat, Joey, has been challenged off and on with litter box etiquette his whole life. As I review your list of “rules”, it seems I have broken many rules over the years! He is an elder now, and no doubt, the box is hard for him to get into. He had an especially hard time using his box when we moved into a new home. I knew he was ill at ease, and tried everything from hugging to a plethora of holistic remedies… but to no avail. But then I found a natural holistic item that worked! It calmed him down, helped him sleep and basically made him more confident and comfortable in his new setting. Potty Box Blues averted but again! fyi, the item is Hemp for Cats (at RxCBD.co)… I give Joey the extract and he is a new man! It has also helped his stiff joints and he is much more active. Again, Thanks to CatWisdom101 ! where can i find out more about the hemp for cats? I found your weblog web site on google and check a couple of of your early posts. Continue to preserve up the very good operate. I just extra up your RSS feed to my MSN News Reader. Searching for forward to reading additional from you later on! Hey humans like privacy and quiet when we potty so why wouldn’t our cats? So true about peeing in one box and pooping in another. It seems the box everyone likes to poop in is in the mom’s bathroom. She wishes it was one of the ones downstairs! Good advice, I’m lucky in the litter box territory. That was really interesting and there were some on there I had not thought of before! That is really excellent advise! “deep box with an entrance cut out can be used to provide high sides” — this was key in our house. Thanks to Layla for the tip to NEVR-MISS boxes. (See badge below.) Did the trick. And they were super-nice about payment issues. Great advice! I’ll keep these rules in mind. I’m glad my boys have not had problem so far. I’ve seen small piece of poop outside the box. But larger piece was in the box so I guess one of my boys left the box too soon. This is all good advice. We are good litter-users, even though the head peep violates some of the litterbox best practices. She knows them and has had to make adjustments in the past for less-behaved cats, though. The boyz are pretty happy. We live in a small apartment and the box is in the kitchen, because we realy don’t have a lot of choice. I have bookmarked this for future reference. This is all good advice. Luckily for my human, we are all pretty low maintenance in the litter department.